This section will provide you with important information to make your stay at UFRGS and Porto Alegre easier. The cafeteria offers food-serving counters instead of table service. The customers serve themselves on a tray. Everyday there is a new balanced diet menu (check today’s menu here) prepared by nutritionists. The price per meal is R$1,30, with the option of buying juice for R$0,30. 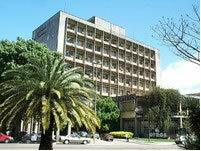 UFRGS has 33 libraries with a collection of 700,000 items and 14,000 periodicals. Libraries serve the University's current faculty, students, staff, and researchers who hold valid UFRGS IDs. The users can use the libraries for in loco research as well as for borrowing materials to read at home. For borrowing books and other materials, the user must have UFRGS ID and password. The first password, generally, is the date of the user’s birthday (day/month/year, as used in Brazil). The users can borrow an unlimited number of items (of course, there are exceptions, like high demand collection items and items that are rare and cannot be borrowed). The borrowed items should be returned according to their classification: daily (up to the end of the day), three days, weekly, and regular (14 days – only available for professors and graduate students). Borrowed materials that are reserved cannot be renewed. Pay attention: if you do not return or renew items at the returning day, they will become overdue. You will, then, start to accumulate fines. The library charges fines on overdue items by day and by item! It is possible to check your library record and to search for items using SABi (Sistema de Automação de Bibliotecas – Automation System for Libraries). SABi offers tutorials on how to use online resources. UFRGS has four campi (Centro, Vale, Olímpico and Saúde). Each one of them is divided in blocks and subareas. It is important for you to know that Porto Alegre is a relatively big city and that these campi are located in different points in the city. Transportation from one to the other requires using bus, car or motorbike and it can be time consuming. Therefore, while choosing which disciplines you will enroll in, you should think about this distance between UFRGS campi. We suggest you schedule classes at the same campus, checking their timetable. Using the Localiza tool, available at UFRGS website, it is possible to find maps of each campus, blocks or subareas, as well as relevant addresses, such as RELINTER’s. You can always talk to the driver to confirm if the bus you are in goes to the desired destiny. UFRGS has three student houses but because of a small number of vacancies, they are mostly available for undergraduate and graduate students with low income. For international students, only those who come to Brazil by the mobility program Escala can stay in a student house. 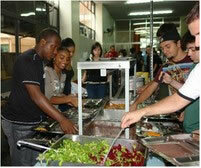 The University also promotes several projects that could be useful for the adaptation of students arriving in Brazil. The projects can be helpful in providing cultural, sports and other kinds of activities. UFRGS has the Agendão Cultural, which is a project that promotes cinema sessions, plays, dance and music shows, exhibitions, book releases, free courses, among other activities. The objective of this project is to provide leisure, culture and entertainment for UFRGS students. The majority of these activities has free entrance and is promoted in the University campi. More information is available at http://www.ufrgs.br/comunicacaosocial/agendao/index.html. Inside University there are other options for leisure, such as visiting the Planetarium, museums or the Astronomical Observatory. Visits occur often in groups. Though they can occur individually, they might be difficult to schedule. Visits to the Museum have free entrance and last about one hour, with scheduling by phone. More information is available at http://www.museu.ufrgs.br/index.php. The Planetarium is open for visits on Sundays, 6pm, and the entrance fee is 1kg of non-perishable food. Visits also occur from Tuesdays to Fridays. More information is available at http://www.planetario.ufrgs.br/. There are projects involving practice of sports that are promoted by the School of Physical Education (ESEF). These projects aim to promote physical activities for the community, improving the health and quality of life of its participants. Sessions with professors’ supervision are available for several activities (bodybuilding, water sports, synchronized swimming, dance, exercising, olympic gymnastics, collective sports and fighting sports). The activities take place at ESEF (Campus Olímpico) and are also free for international students, depending on the vacancies available. The activities occur from 8am to 6.30pm, not closing at midday. More information is available at http://www.esef.ufrgs.br/comex.htm.